The Mark II was a step away from the heavy and costly 10er, and it helped fund the development of the Mark V which was already on the table when this was introduced. Lots of stamped steel and aluminum was used, and the tubes were shrunk in diameter from the 10er to save weight and cost. The feature that fools the casual Shopsmith historian is the crank on the front of the Headstock. What do you think it's for? No, it's not a variable speed crank like the one found on the Mark V and Mark VII. It simply elevates the motor a bit so the user can manually move the drive belt from pulley to pulley. This tool was sold mostly through hardware stores and under the name PowerKraft by Montgomery Wards. 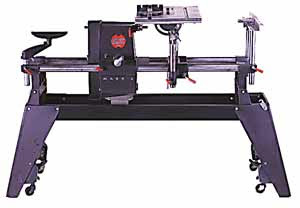 Click our "Shopsmith Ads and Articles" page for a great article on the Shopsmith Mark 2. 1958 Magna Mark II Article "The New Mark 2 Shopsmith"
1958 Magna Shopsmith Mark II Ad "Now! A Shopsmith For Only $179.90"
Subpages (2): 1958 Magna Mark II Article "The New Mark 2 Shopsmith" 1958 Magna Shopsmith Mark II Ad "Now! A Shopsmith For Only $179.90"